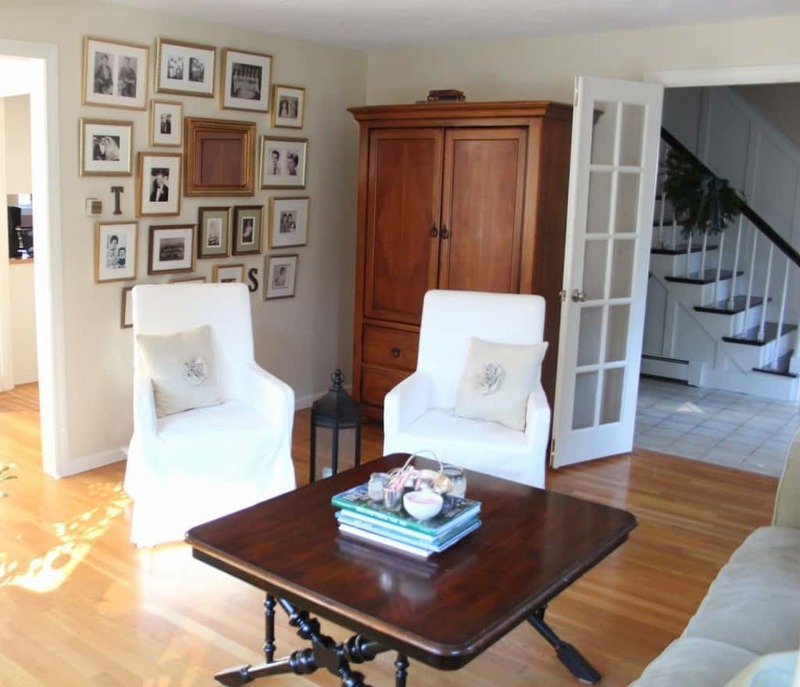 It’s been a big week at this casa thanks to Linda and her One Room Challenge! I’ve been dreaming of a wall of bookcases for just about ever and the ORC was the perfect motivation to get this done. I can’t think of a better room to have in a house than one that is piled high with books. Never mind that our current abode has about zero character or architectural interest – it’s an empty canvas just waiting for the likes of me – who fancies myself as a carpenter despite having no real skills – to come along and bling it out. First up – the wall I planned on putting the bookcases on – the one surrounding the French doors – did not work out. I kind of ignored the fact that the huge armoire in our living room had to go elsewhere to make the bookcases happen on this wall. 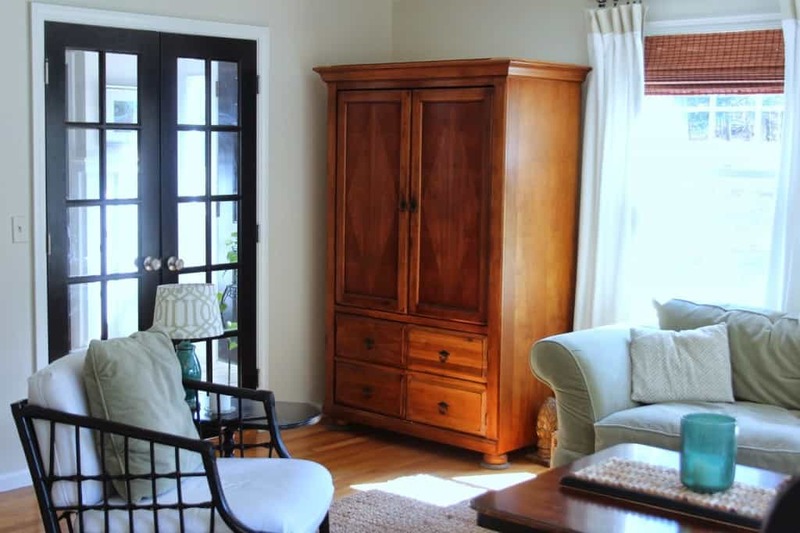 I envisioned the armoire in our finished basement, storing blankets and bedding for the extra teens and tweens we always have around the house on the weekends. Long story short – it weighs a ton and took 4 burly movers to get it in here in the first place, so moving it would not be easy. (I had blocked that out when I was dreaming of my bookcase wall.) SO. Plan B. Keep the armoire (that I actually like, it just takes up a lot of square footage) in the room, and reconfigure the bookcases. Down came my black & white photo wall on the wall facing the dining room – and up went three Ikea Billy bookcases. 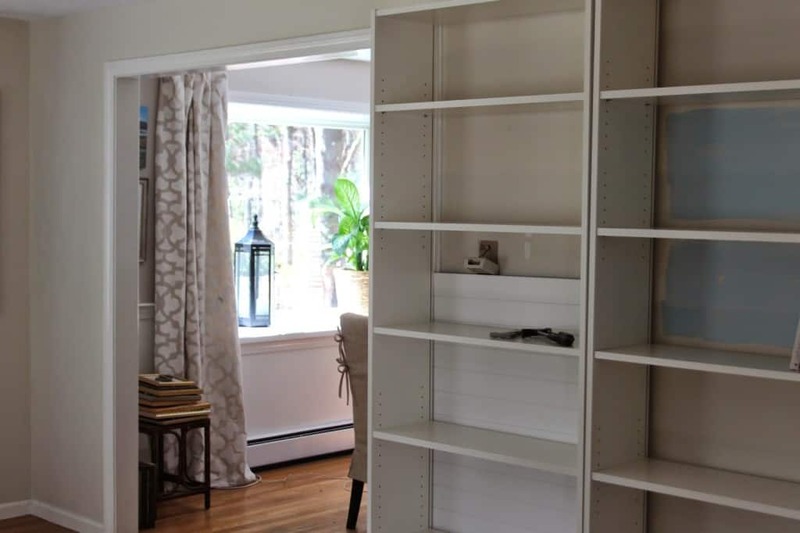 I toyed with building them from scratch using this bookcase tutorial on This Old House. In the end, I decided on the Ikea bookcases because they are easy to assemble and I am tackling these on my own. The bigger task with this project is stabilizing the bookcases to the wall and trimming them out to make them look built-in. The jury is out on whether buying the Ikea kits is more cost effective than building bookcases from scratch. At the end of the ORC I’ll tell you how much the bookcases and supplies added up to. The three Billys I built for the front wall were almost a perfect fit here – just half an inch too long! 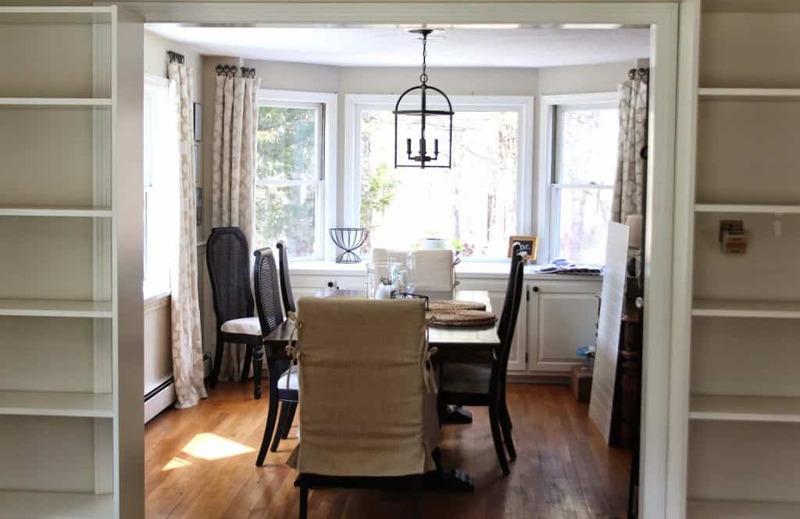 I immediately loved them in this spot…..except for the fact that the other side of the doorway into the dining room looked awfully lonely and unbalanced. 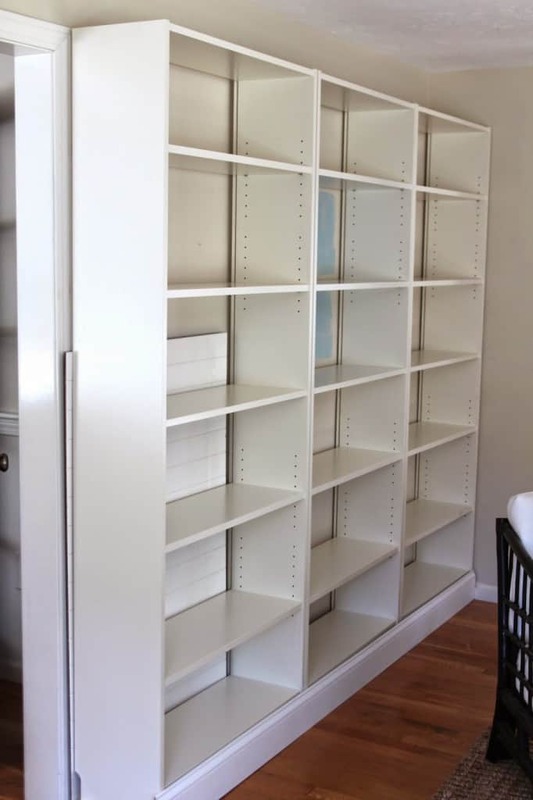 I showed some of these last week – bookcases that span over a doorway. I am a huge fan. I think they look so custom and just AWESOME. What do you think about them? Since the ceilings are not very high in this house, there is less than a foot over the bookcases, and crown molding will be taking up a good bit of that, so while I wouldn’t be able to have a shelf up there I can box out the space over the doorway like in #4 above to unify the bookcase wall. Placing a bookcase on either side of the doorway gave me a feel for it and I love them framing out the view into the dining room and our backyard beyond. Next week I’ll show you what I did to customize the bookcase backs….it might be the part I am most excited about!! Did you see the progress of all the ORC designers yesterday? So inspiring! Today is the day the ORC Linkers share our posts at Calling It Home, and wow is there some crazy talent amongst the linking participants! Check them out here. Wishing you a wonderful weekend ahead, my friends! 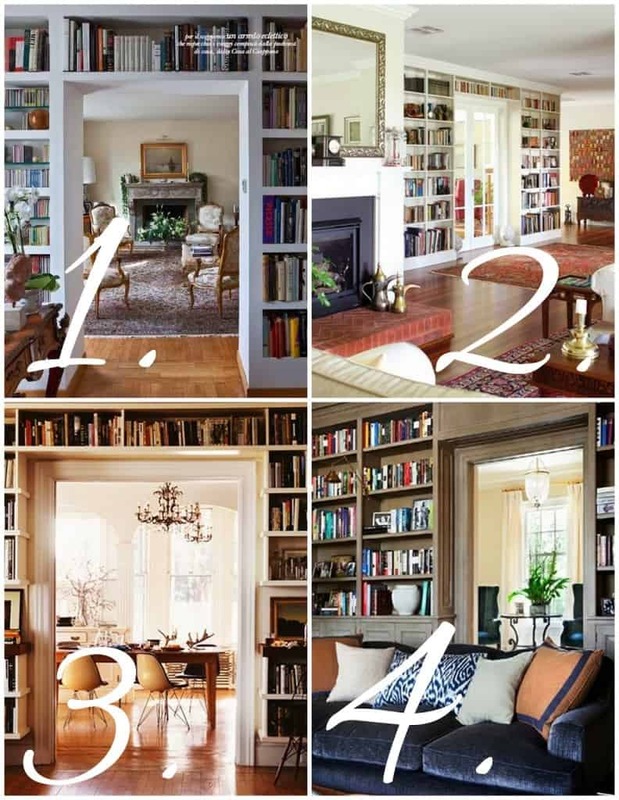 A big fat YES for the bookcases around the door frame! I love where you're headed, Lisa, it's going to be phenomenal! Have fun on your trip! LOVE the bookcases framing the doorway! This is going to be stunning! I agree, love the bookcases framing the doorway. I can't wait to see this when it's done. It's going to look so awesome! Yes, frame away! Have a great weekend! I can see it already Lisa and it is going to be fantastic!! Love framing the doorway with the bookcases! You can do it girl!! Love the bookcases around the door, so pretty. 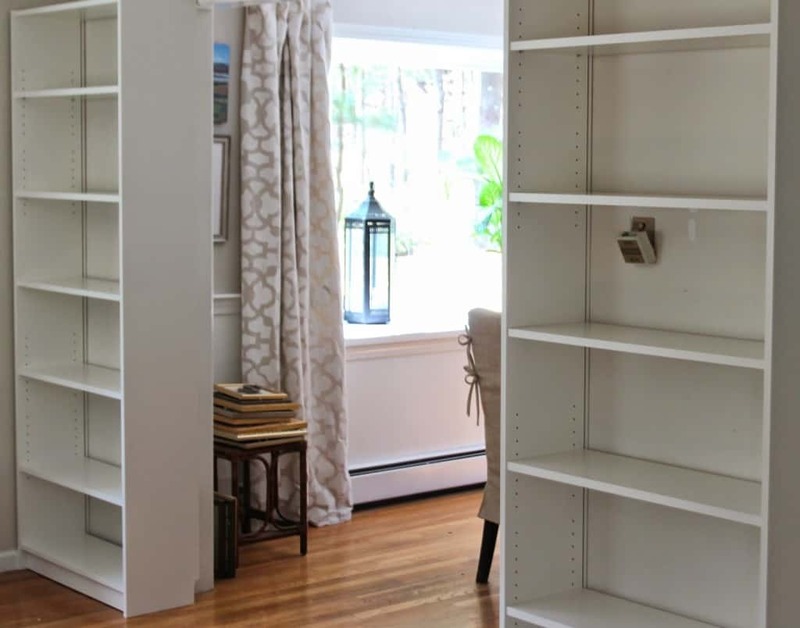 While your initial plan didn't work out I do love the look of the bookcases flanking the dining room. Godd luck. This is going to be so awesome…can't wait to see it finished!! frame that doorway, sister! it's gonna rock my world. Love the idea of framing the doorway. We added a wall of bookcases in our living room years ago turning it into a music/library room. We love it! A space that now gets used. I am in love with this bookcase wall and you are so right that a little trim over the door will tie it all together!!! LOVE!!! Have a fun 'big person' weekend!! woohoo! It's looking great Lisa!!! So exciting! It looks amazing already and you haven't even shown us the good part! I share your affection for bookcases that frame doors…greatness. Enjoy your hubby time! WOW!! Loving how the bookcases are coming together!! I would for sure but them over the doors!! Keep up the good work!!! First of all, enjoy your getaway, I am jealous! Don't think about the ORC while you are gone, the bookcase install will be there when you get back, unless of course your inlays finish them while you are gone. I love the look you are going after and know that you will make it fab. Too bad about the armoire tho…. Pam had an excellent solution I thought! I love decorating with books. Looking forward to seeing your shelves completed, and to seeing how you style them. I love the way you are framing the doorway. I am so excited to see how this will turn out! Enjoy your time away! Lisa- it's looking so amazing! I'm so excited for your bookshelves flanking the doorway- very chic and classy. I'm so in love with the bookcases on either side, as well as above the doorway. It is going to look amazing. And cheers to you for doing all of this on your own. Get it girl! I absolutely love the armoire, but I even more adore the bookcases framing the doorway. I can't wait to see it all finished :)See you next week! I love the #4 pic option! I'm a big fan of the bookcase around the door look! I am so excited to see this project unfold. 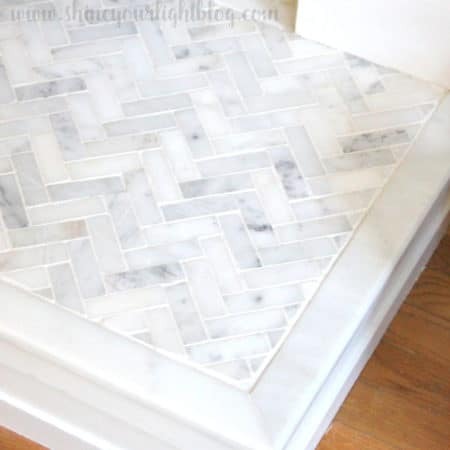 I really want to tackle this one day in our house!